Life’s Journey is indeed amazing. I met Sherry when she was 9 years old. She was the sister of a friend and neighbor. I was 11 years old at the time and it was the 6th place I had lived in that far along the journey of life. 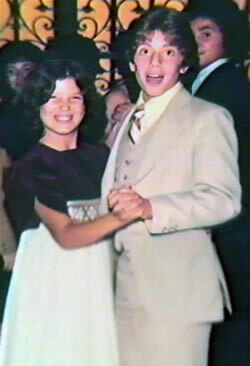 Although we were not romantically involved we became friends and I even got to dance with her on the day of her Brother Dana’s Bar Mitzvah, check out the proof to the left. That was the beginning. We both went on to lead our own lives, always in some way keeping in touch. We even shared a commonality – living in Texas for a short period of time. I did when I was about 6 years old for about 2 years and she did when she was about 14 for about a year and a half. Sort of an Ironic connection and exposure. Things don’t just happen, they happen for a reason and if you are open to the possibility and trust in the process of life anything can happen. We both ended up back in NY and again our paths crossed over and over again. My beliefs are that this was absolutely the way things were meant to be. So then turn the clock forward a few years from that, and I moved to Florida to pursue a Graduate Degree in Economics and due to economics that dream of an MBA was not realized. I was forced to let that go and not too long after I did Sherry moved to FL to go to FAU and be with her then Boyfriend. Wildly, at that time I too was involved with someone else. However in January of 1990 fate drove us back together AGAIN. Independent of knowing it each of us broke off our engagements to other people. Both for many reasons, but primarily we knew the partners we then had were not going to make us happy. A few days later we spoke on the phone and both of us were in the mood for some Nathan’s Famous Hot Dogs and we met for a bite. There was a twist of fate there as a friend of Sherry’s joined us and it was her former fiancé’s sister. We sat and for the first time in many many years, I had butterflies in my stomach and all I could think of was wow oh, this is Dana’s little sister. However there was no denying the fact that we both felt it. Two months later I asked her to move in, and a few months later we were both absolutely sure this was the love of our lives. Less than 2 years after that we were married. The course of life then took us on. I became very successful, first as a Textile Mill Worker, then a Salesman, then I went on to help build someone else’s dream in Textiles as Vice President of Sales and Marketing. The company grew and we benefitted greatly from that growth. That was until a Super Bowl party at one of the owner’s homes. There it struck me. My house could fit in his Living Room at the time, and that night I lay awake sowing the seeds of thought that it was now my time to create my own way. I did just that. Less than 9 months later I started my own Textile Sales and Distribution Company. That grew and grew until ultimately I felt it was time to build a factory to make niche fabrics to service the Resort and High End Sportswear Industries like Nike, Reebok, and Addidas. We grew quite a substantial company until January of 2004. A friend and awesome business associate from Reebok called me and arranged a meeting. That meeting would turn out to be the most Earth-Shattering meeting of my life. He basically stated that his company as well as all of the other’s, we had build our company on, were going to go to nearly 100% outsourcing to the Far East. In less that six months there would not be any business at all. So after that shock and upset set in, and I was able to deal with it I attempted to rebuild the business and made contractual arrangements with Local People in FL. A second blow was dealt when NONE of those people lived up to their end of the deals and they too went all offshore. It was a matter of economic necessity for them as the retailers basically dictated what would sell and at what price. My entire career in Textiles was gone. Though we did sell off the equipment, the end was not as pretty as the rewards we’d enjoyed for many years from the company that we had built. I called the number and left a voice mail. I found when she called me back that she was new to a company representing this very opportunity and that she had been a Nurse in Los Angeles before this. At that point I judged this as a joke. My soured attitude was blocking me at that very moment from this business that would come to change our lives. Not until about 3 months later on another trip would this smack me in the face and wake me up. I returned to New York City for another gut wrenching meeting with Chase Manhattan Bank. That night as things did not go well in the meetings, I Googled ( I love that this has now become a verb) “Home Based Business” and this woman’s web page came up – the exact same woman from 3 months prior! I called her and flew home the next day. That night, I stayed up all night thinking, WHAT IF THIS WAS MY CHANCE TO RECREATE MYSELF ??? I thought back to when I actually operated a Textile Knitting Machine, working 12 hours a day. I remembered that without allowing all possibilities, I would still be making an hourly wage working 60-72 hours a week to provide for my family, and faith refilled my heart and I decided to GO FOR IT! Remarkably it not only changed but saved my life. Not only was I able to make the transition, it is now almost 4 years later and I am still here. Still here offering this opportunity and changing lives. Sherry and I now work the business together. She is more behind the scenes than I, but as you look over the pictures on this web site you will see how our lives were affected and changed and even more importantly than ours – watch our children – Samantha (11) and Alyssa (9) as they have been saved as well. Their lives have been dramatically changed, just look at where they have been and what they have gotten to Enjoy as a result of all of this.